The famous line of “you’re gonna need a bigger boat” was uttered in reference to a murderous shark. Obviously, the mud and dirt outside our front door is less threatening than a very large fish. However, protecting the house from Mother Nature’s ongoing assault is a no less of a battle. Most of the year, two mats at either door in the mudroom are sufficient for containing the dirt that comes in on our boots. However, in the winter, when the mud and the wet increase, a bigger rug was required. I needed something durable that would trap lots of dirt. And it had to be cheap, of course. Growing up, we always had a cocoa mat at the front door. And I always hated it. It was scratchy and ugly, in my naive child’s opinion. However, it worked, and when we moved into the farm last year, it was only a few weeks before I went out and bought one of my own. Now that I needed a bigger rug, I decided cocoa was the way to go. Rona sells cocoa mat by the linear foot, so I decided to buy two strips and make my own rug with the help of some duct tape. I “tacked” the seam every foot or so with a short piece of tape making sure to keep the two runners tight and even. Then I went over the join with a single strip of tape. My helper carefully checked everything. 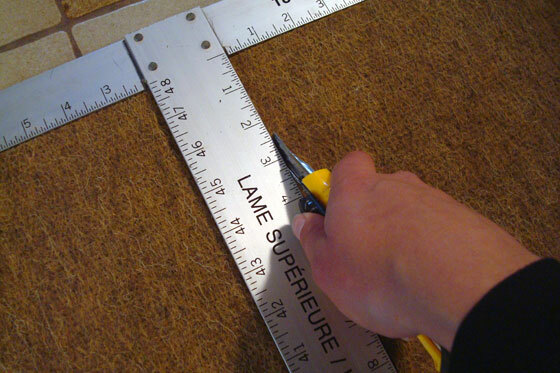 I cut the rug to the exact length using a drywall square to get a perfect straight edge. The finished rug is 52 inches wide by 9 1/2 feet long. The seam is mostly invisible. It probably won’t keep sharks at bay, but so far it’s doing a good job of handling the dirt that keeps trying to invade the house. 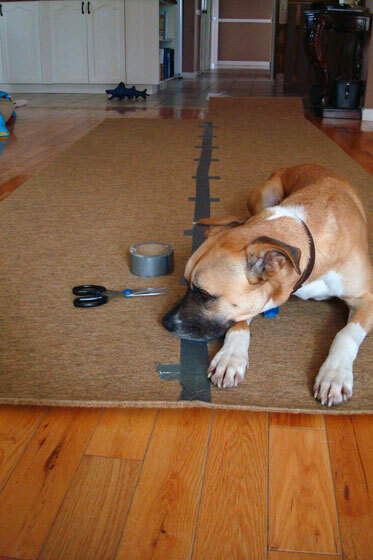 Have you ever made your own rug? Are you on the like or dislike side of cocoa mat? 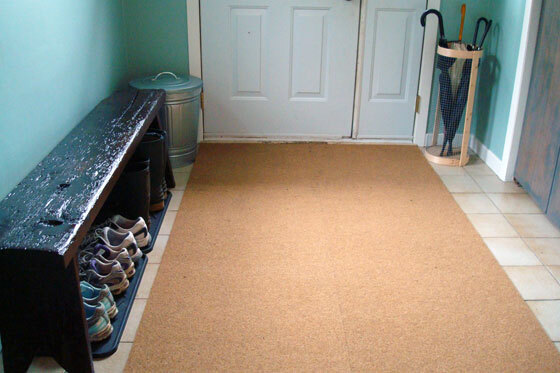 How do you handle floor covering at your entryway? This is an awesome solution! It worked out really well. Oooh. That’s a good idea! Sharkey is a good tough toy. Too clever. I didn’t even make that connection when I was writing the post! Now I wish I’d featured Sharkey somehow. Great point. It’s all about coordinating with the dog.